James Dalton continues to flex his split deck series skills with today’s BoardPusher.com Featured Decks. This time around he tackled what is sure to be a crowd pleaser, a Galactic Empire TIE Fighter Pilot. If you’re unfamiliar with James’s skateboard series you can see more of them at kingsofnobody.com or follow him on Instagram @kingsofnobody where you can possibly get a glimpse at a future series. Fingers crossed. See how to create your own split deck series here then try it for yourself at BoardPusher.com. 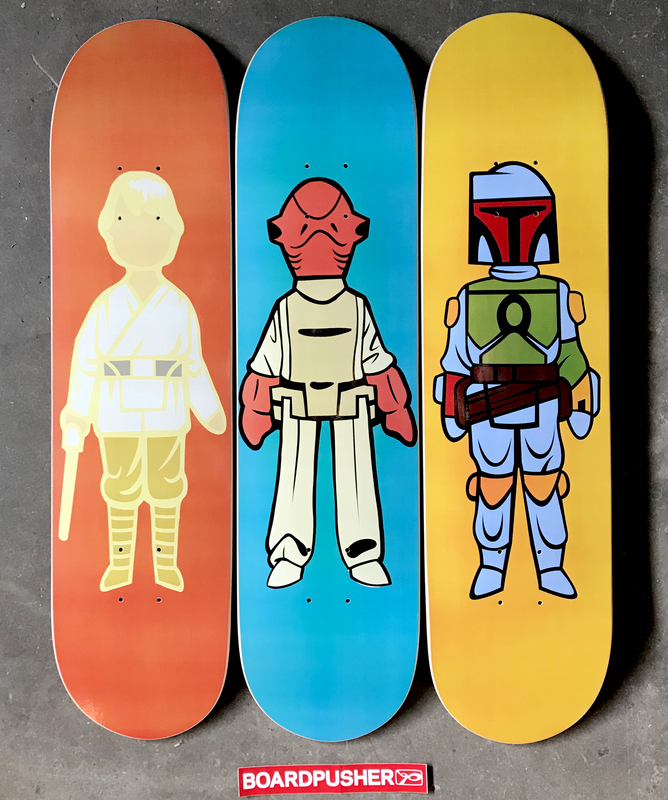 It’s May the 4th, so for Star Wars Day we wanted to celebrate with these BoardPusher.com Featured Decks created by Heels & Zimerman. 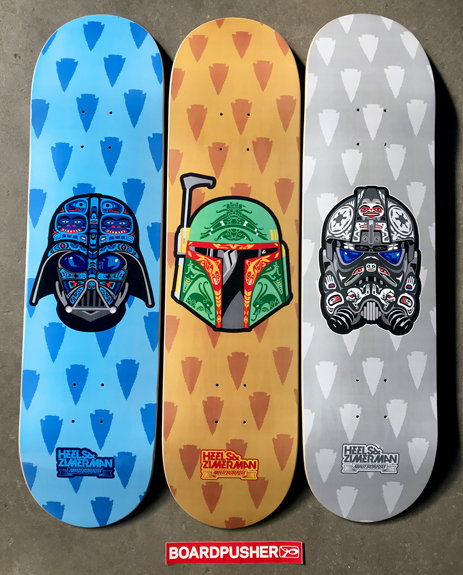 “CHIEF”, “BRAVE”, and “TOMAHAWK” are all available at BoardPusher.com/shop/hzskateboards. 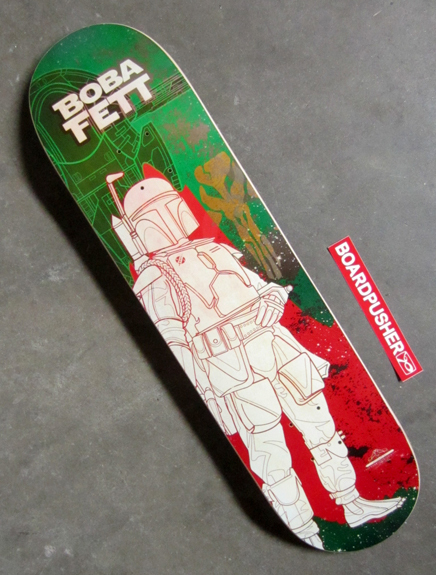 Check out some past Star Wars inspired Featured Decks here. Use your original fan art to create a custom skateboard graphic at BoardPusher.com. 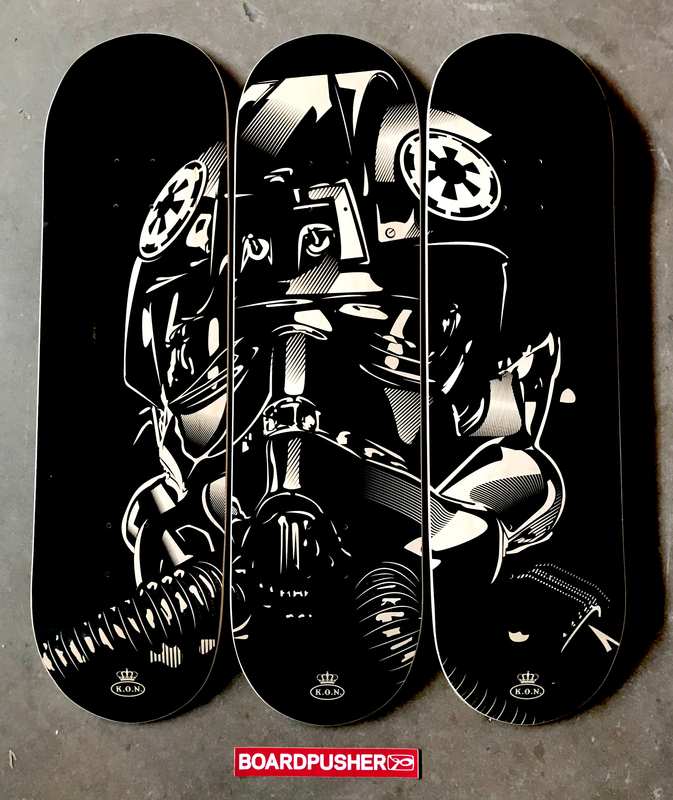 The guys over at the YouTube Star Wars talk show, Black Series Rebels, decided they wanted some custom skateboards for their set, so they uploaded these graphics at BoardPusher.com and they’re today’s Featured Decks. They occasionally hold giveaways and sometimes include these boards so watch their weekly videos here and follow them on Instagram @blkseriesrebels. Got a fan art idea that would look good on a skateboard? Make it happen at BoardPusher.com. 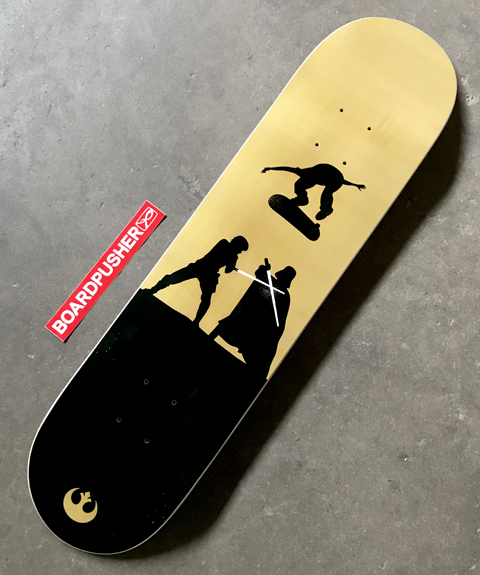 Today’s BoardPusher.com Featured Deck was put together by Nicole Martin who’s killing the girlfriend game with this anniversary gift for her Star Wars loving, skateboarding boyfriend. You can see some images from the photo shoot this graphic was born out of by following Nicole on Instagram @ginnywap. Show off your art and fandom by creating your own skateboard graphic at BoardPusher.com. 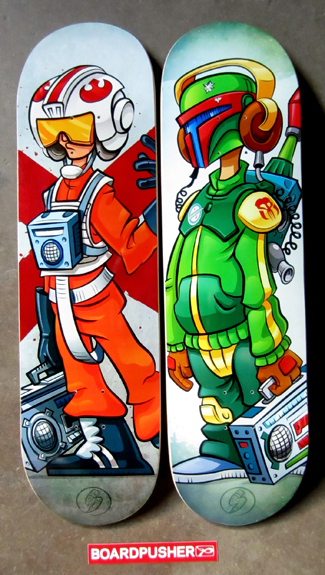 Here’s another couple of BoardPusher.com Featured Decks from David Gonzalez’s Star Wars influenced Galactic BBOY series. “BBOY VDR” and “BBOY TR8TOR” are “inspired by the Empire’s finest, these boards feature two of the illest members of the GALACTIC BBOYS! Cuz everyone knows DARKSIDE beats are the best.” Follow David on Instagram @nopal62 or check out his store here for more pop culture art. Draw what inspires you and make it a skateboard graphic using BoardPusher.com. 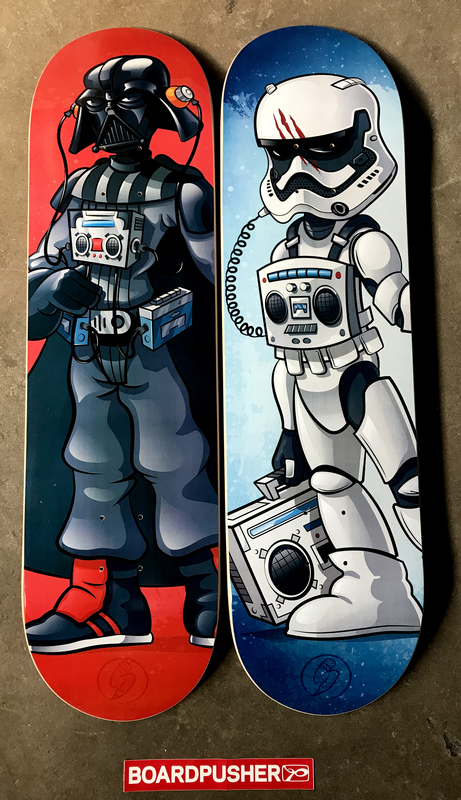 Since May the 4th is coming up this week, we thought this graphic by Traina Design would be a good BoardPusher.com Featured Deck. Traina Design dabbles in quite a bit of graphic design work which you can check out on their website trainadesign.com or see some more of their deck designs by following them here or here. No matter what your design style is you can turn it into a skateboard graphic at BoardPusher.com. Seems appropriate that this week’s BoardPusher.com Featured Decks are a couple of Star Wars inspired skateboard graphics. “BBOY XWING” and “BBOY Fett” were created by David Gonzalez and are a part of his BBOY BOOMBOX series. Check out the rest of the series and more of David’s artwork at nopalArt.com. Put your own personal style on a skateboard graphic using BoardPusher.com. We’ve had a handful of Featured Decks from Tom Ryan in the past and we’re stoked to see this Star Wars influenced graphic as his latest contribution. 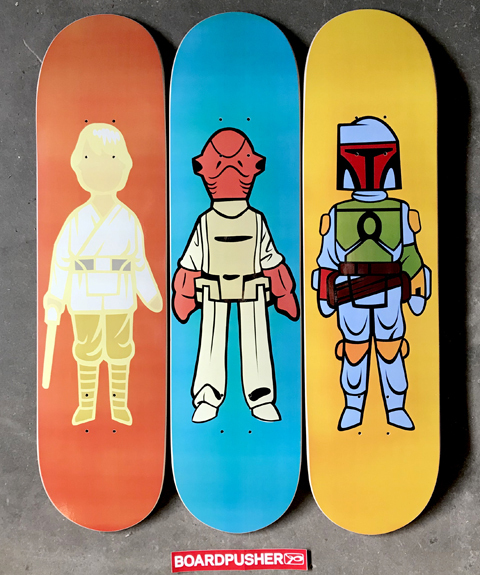 You can see “Bounty Hunter” alongside his other pop culture inspired graphics as well as some of his hand painted designs that he has digitized at BoardPusher.com/shop/tomryansstudio. Designing skateboards is fun. We’ve also made it really easy. Give it a try at BoardPusher.com. 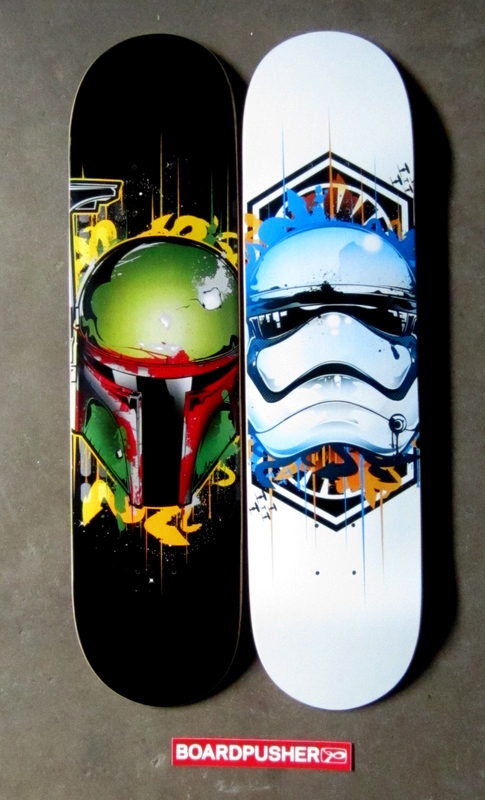 This week we have a couple of BoardPusher.com Featured Decks, “Bounty Style” and “Trooper Style” designed by Carlos Donoso of inkOne. Check out more of Carlos’s pop culture influenced style on Instagrm @inkone_art. Try turning what inspires you into skateboard graphics by designing your own on BoardPusher.com.